Springtime is here, ladies! Flowers are in bloom, the sun is beaming brightly, and the time has come to shed layers of clothing and show some skin! I don't know about you guys, but down in the south the temperatures are steadily rising and I'm starting to see A LOT of skin. And it isn't even sundress season yet! As a mommy and wife who is always on the go, I want to make sure my skin is in the best condition-- no matter the change in the weather nor season. And I want to do so without all the fuss of using so many different products or spending a lot of money. So I've added two new products to my morning and evening beauty routine and I'm sharing them with you today! 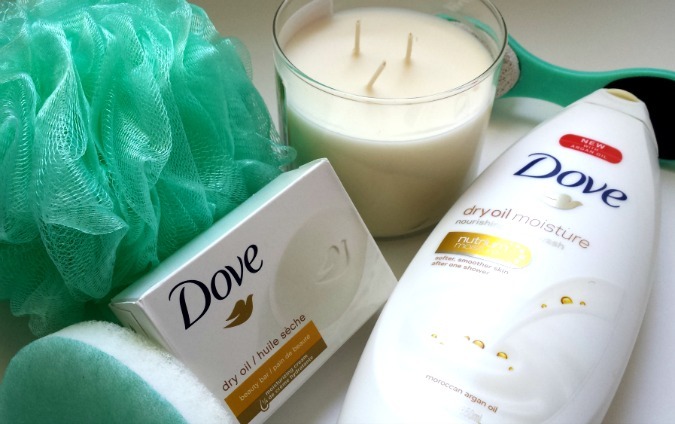 I’ve partnered with Dove to tell you all about their New Dove Dry Oil Collection featuring their Dove Dry Oil Beauty Bar and Dove Dry Oil Moisture Body Wash. I start my morning off with a warm shower complete with my loofah, face exfoliator, my favorite shower cap, and some loud, empowering tunes. 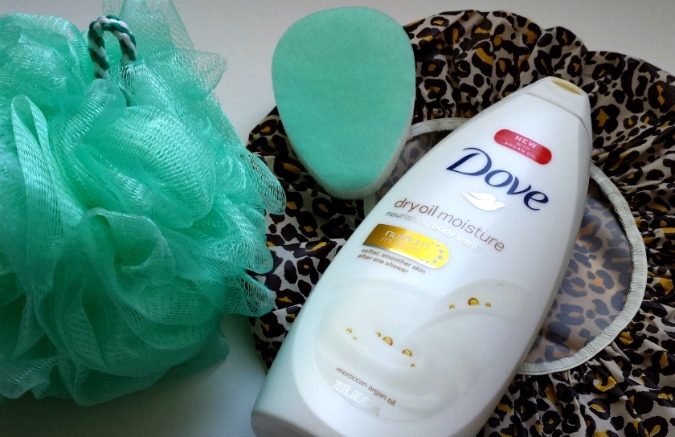 Adding Dove Dry Oil Moisture Body Wash has taken my routine to the next level! As soon as I begin to lather up with the Dove Dry Oil Moisture Body Wash, I receive an instant energy boost. The rich aroma of the Moroccan Argan oil awakens each of my senses! The new Dove Dry Oil collection helps nourish and protect skin from dryness in the shower by effectively cleansing without leaving skin feeling dry and features a nourishing formula infused with Moroccan Argan oil beads to gently cleanse while helping to replenish nutrients to the skin. After using, I feel smooth, squeaky-clean, and ready to start my day! And because 9 in 10 women are concerned about having dry skin, Dove Dry Oil Moisture Body Wash goes beyond basic moisturizing to help women nourish and protect their dry skin. 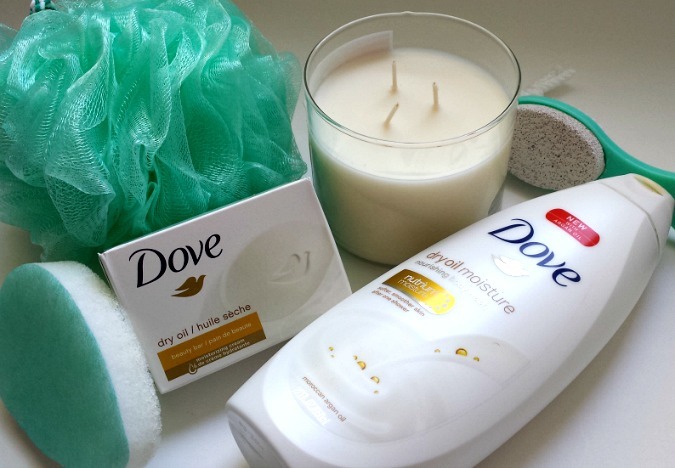 On late evenings when I want to unwind in my privacy, and my toddler goes to bed early, I indulge in a warm bath with my new Dove Dry Oil Cleansing Bar. This bar is formulated with 1/4 moisturizing cream and Moroccan Argan Oil, which is perfect for nurturing the dryness my skin has experienced throughout the winter months. The scent of this luxurious beauty bar on my skin coupled with the scent of my favorite country market candle makes me feel like I'm in the spa "for the low." 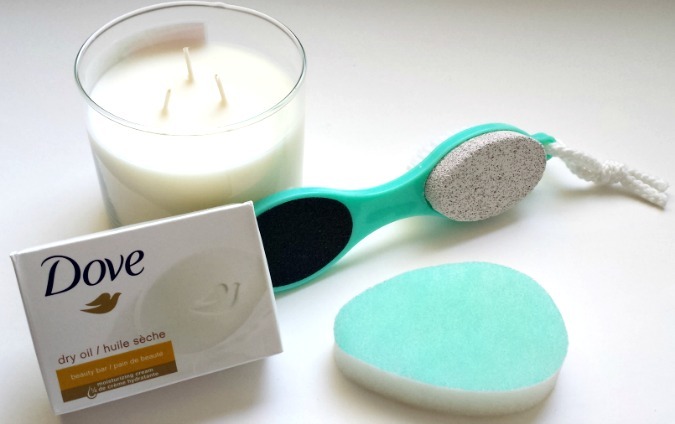 After bathing, I make sure to slough off any dead skin with my pumice stone and body brush. I always make sure to pay special attention to my feet, knees, and elbows. Here, I've had a spa-like experience for a fraction of the cost! If you haven't yet, take inventory of the items in your beauty arsenal--preferably each season. If your skin lacks the nourishment it needs to be springtime smooth, be sure to visit your local drugstore and grab up the new Dove Dry Oil Collection. And for a truly pampered experience, stock up on bath & body care essentials such as pumice stones and body brushes as well. Your skin will thank you for it! Have you tried the New Dove Dry Oil collection yet?